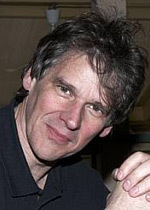 Peter Watts (born 1958) is a Canadian science fiction author and former marine-mammal biologist. He earned a Bachelor of Science degree in 1980 and a Master of Science degree in 1983, both from the University of Guelph, Ontario, and a Ph.D from the University of British Columbia in Vancouver, BC from the Department of Zoology and Resource Ecology in 1991. He is known for the unusual practice of making many of his novels and short fiction available on his website under a Creative Commons license. Watts believes that doing so has "actually saved [his] career outright, by rescuing Blindsight from the oblivion to which it would have otherwise been doomed. The week after [he] started giving Blindsight away, sales tripled." Watts' works have been nominated three times for a Hugo, winning once; nominated 5 times for the Prix Aurora, winning once; and have received nominations for the BSFA, Campbell, Sunburst, and Sturgeon Awards. His works have repeatedly placed high in the results for the Locus Annual Readers' Poll. Watts is famously known for the quote by speculative fiction reviewer James Davis Nicoll, who of his writing once said, "Whenever I find my will to live becoming too strong, I read Peter Watts." In addition to his novels and short stories, Watts has also worked in other media. He was peripherally involved in the early stages of the animated science fiction film and television project Strange Frame. He also worked briefly with Relic Entertainment on one of the early drafts of the story that would eventually, years later, become Homeworld 2 (although the draft Watts worked on bears no resemblance to the one used for the released game). More recently, he has been recruited by Crytek as a writer and art consultant on Crysis 2. Technological elements from Blindsight have been referenced in the fictional Crysis 2 "Nanosuit Brochure". The creative director of BioShock 2 has cited Watts's work as an influence on that game. In December 2009, Watts was detained at the US/Canadian border by U.S. Customs and Border Protection performing a reportedly random search of the rental vehicle he was driving. Watts is alleged to have assaulted a CBP Officer and was turned over to local authorities to face charges. According to an officer, the authorities used pepper spray to subdue Watts after Watts became aggressive toward officers. According to Watts, he was assaulted, punched in the face, pepper-sprayed and thrown in jail for the night. The officer later admitted in court that he had punched Watts. A jury found Watts guilty of obstructing a U.S. Customs and Border Protection officer. He faced a maximum sentence of two years in prison. Watts blogged about his sentence saying that because of how the law was written, his asking: "What is the problem?" was enough to convict him of non-compliance. In April 2010 he was given a suspended sentence, and a fine. However, due to immigration laws, Watts' felony conviction prevents him from re-entering the United States. In February 2011, he contracted the rare disease necrotizing fasciitis in his leg, and blogged about the experience on his website as he went through the illness, surgery and healing. He married Canadian fantasy author Caitlin Sweet in August 2011. They live in Toronto with their cats and her two daughters from a previous marriage.